Video creation - Promotional or explainer video for your social media page, website integration or an informational video such as a tutorial, an orientation, a virtual tour or a safety video, we have what it takes to deliver an impactful end-product. Website design - Whether you need a simple site or a more complex one with e-commerce capabilities, we have the know-how to deliver aesthetically pleasing, cohesive and functional websites and of course, SEO and mobile friendly. Photography - Product photography for your e-commerce site, brochures or menus, corporate head shots and branding photography, real estate, buildings, event and editorial photography. Our state of the art equipment and our skillful photographers can handle it all. Social Media - Whether it's to gain attention or increase your brand awareness, we can help you manage your social media campaigns. 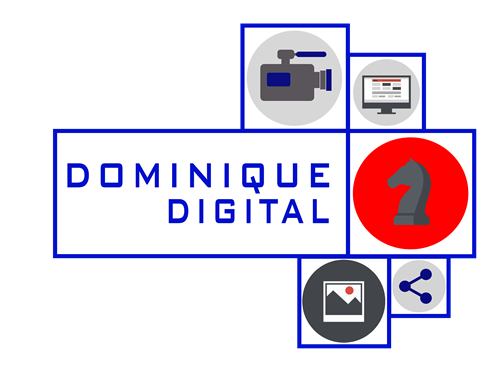 DOMINIQUE DIGITAL is a full-fledged digital media and marketing company helping companies build an active online presence. We provide all the creative and technical services you need to build your company. Videography, Video adverts, Commercials, YouTube channels, Web Series, Tutorials. Photography, Corporate, Family, Head shots, Events, Products. Social Media Marketing, Pay-per-click, Automated Sales Systems, Online ads and Campaigns. Visits by appointment only. We're located in a cul-de-sac near the Sportsplex Arena. Our address is easily found on Google Maps but if additional help is needed, please call us at 780-504-1222.